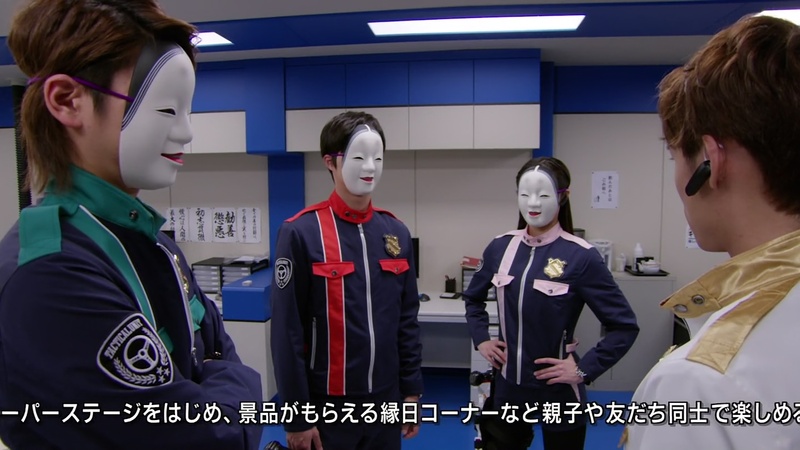 Recap: Kaitou Sentai Lupinranger VS Keisatsu Sentai Patranger, Episode 21 – Friend or Foe, On Board or Not? Noel presents the Lups with the two Collection Pieces he retrieved in the last episode. They don’t trust him, but he says he is on their side. Kogure pops up and vouches for him. He says Noel is an engineer who modifies Collection pieces, but also works for the Lupin Family. The Pieces the Lups have were passed down from the Lupin Family. But Noel was able to make some after he wormed his way into the GSPO and got his hands on the Collection Pieces in their possession. He says he didn’t mean for them to end up being used by the GSPO and the Pats. Noel says the GSPO does not have any more Collection Pieces. Down in the underworld, Dogranio tells Goche and Destra to let “X” run free as something amusing might result from it. Next day, Noel walks into the GSPO in his new white uniform and is welcomed by glares from the Pats. Commander Hilltop tries to calm the tension. But the Pats don’t beat around the bush. They are worried Noel is a spy especially after handing Pieces over to the kaitous yesterday. Sakuya correctly points out that Noel probably knows the kaitous’ real identities. But Noel says he cannot answer any of their questions because he is on a different mission than them. Jim Carter confirms he is an undercover agent sent directly from France HQ. Noel adds, however, that he is trying use the Collection Pieces to serve humanity. He created items to help defeat Ganglers, after all. Commander Hilltop wants to put an end to this interrogation. 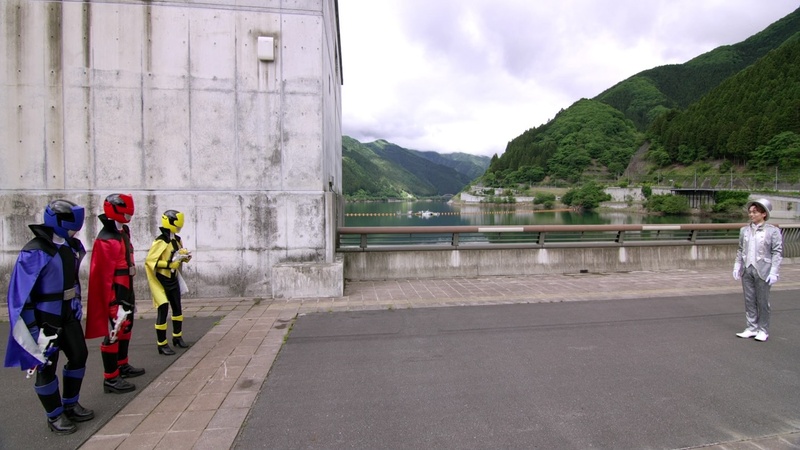 But Keiichiro says it is not easy to put their lives in the hands of someone they don’t fully trust. Before they can hash that out, Jim Carter alerts them to Gangler Gabatto Kababacchi messing around at the dam. As the Pats head out, Noel calls Kairi to tell him about the Gangler and asks if he’s on board or not. At the dam, Gabatto is brushing tooth decay onto the dam so it breaks and drowns the city. The Pats arrive and quickly morph. The Lups watch from above. They still don’t fully trust Noel, but decide to try and use him if they can. The Lups morph and hop down to join the fight. Podamans pop up and it’s an all-out battle. Kairi tries to kick Gabatto, but he activates his Collection Piece which puts up a protective armor all over his body. But while describing that, it gives Kairi the opening to unlock Gabatto’s safe and take the Piece. Both the Lups and Pats bombard Gabatto with attacks. Good Striker flies in and Keiichiro grabs him. The Pats combine into Ugou and send Gabatto’s safe flying into the river. The Pats then chase after the Lups. Goche pops in and is unsure what to do with the safe in the water. The Pats watch from afar as the Lups meet Noel on top of the dam. Noel says it is time for the Lups to pay the tip fee. He morphs into Lupin X and charges at the Lups. Noel says he is a kaitou that steals from other kaitous. The Lups think that is very shady. But Noel is able to counter all of their attacks. He then switch morphs to Patren X and continues the battle. Noel is able to swipe the Collection Piece and says he will do all he can to ensure a lasting peace. Just then, an embiggened Gabatto pops in. 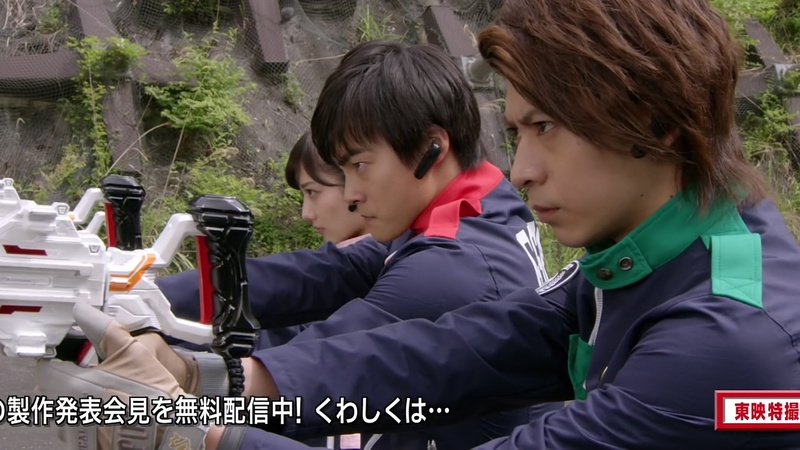 Noel tosses Tsukasa and Sakuya his trains and asks if they will fight together with him. They nod and hop into the Fire and Thunder trains alongside Noel. 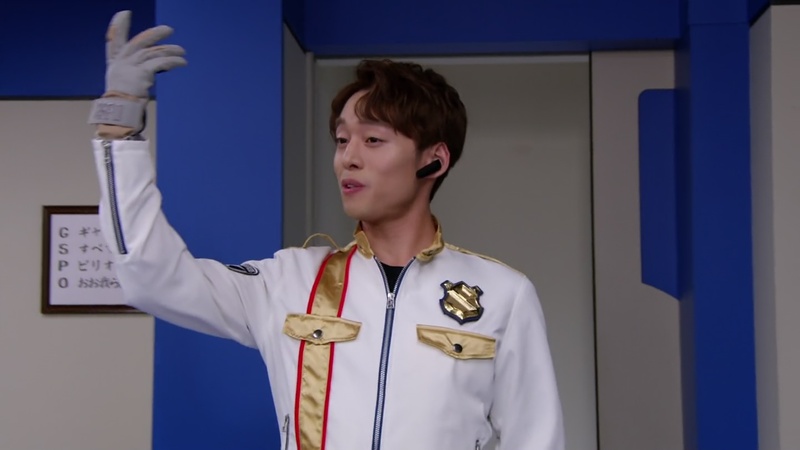 Good Striker flies in and Keiichiro decides to go as well. 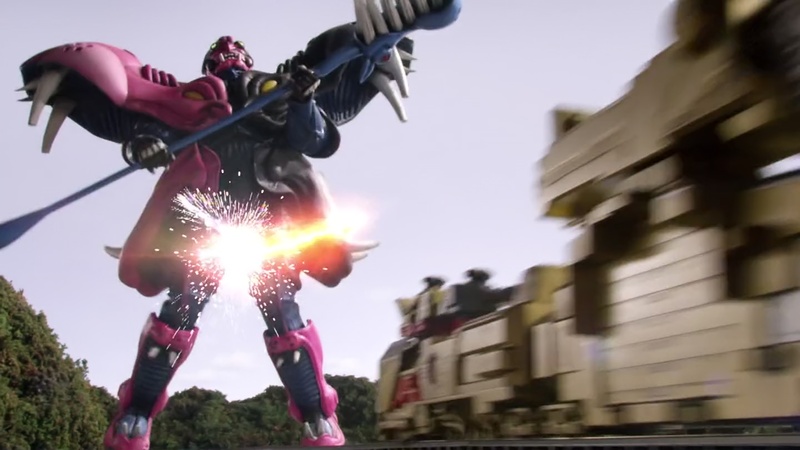 The Pats combine into PatKaiser Trains. Noel shoots at Gabatto’s crotch and the Pats deliver a Spark Up Strike finisher to end him. 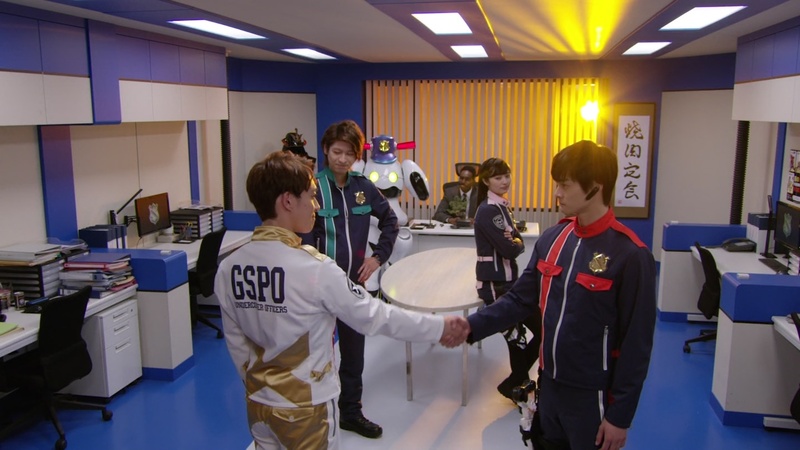 Back at the GSPO, Keiichiro holds out his hand to Noel. Before Noel takes it, he wants them to know he will be doing things his way. Keiichiro says he knows and he is putting faith in Noel’s resolve to fight for peace. Noel thanks him and they shake hands. Sakuya says he trusts Noel too, while Tsukasa says they have no choice for now. Commander Hilltop says it’s all settled then. Over at Jurer, the Lups reveal that he whole thing at the dam was an act to get the Pats to trust Noel. Umika is still not sure if they can trust Noel. But Kairi says they will use him, not trust him. 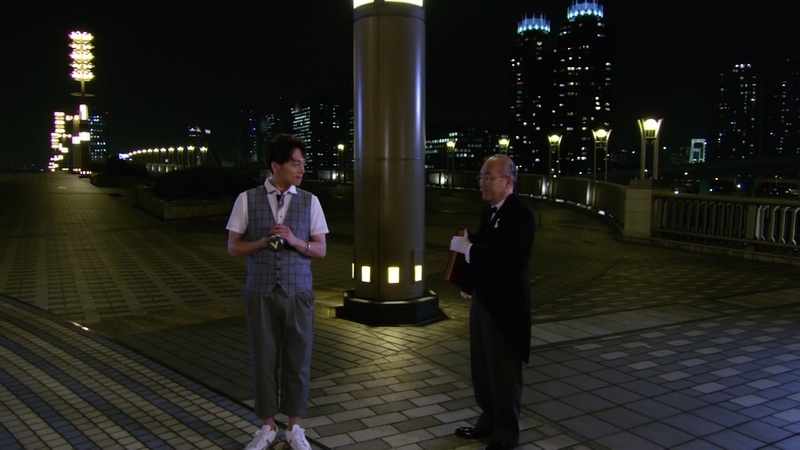 As Noel walks along downtown, Kogure pops in with the book hoping for the Collection Piece. But before Noel hands it over, he wants them to talk. So an interesting episode. I think my opinion of it changed like 10 times throughout. But at the end, I am mostly hopeful with the potential they have set up for Noel. I think the episode was a little sloppy in maintaining the “Is he? Or isn’t he?” guessing. Whether or not he’s all-Lup or all-Pat. At the end of the episode, I think he’s still 50/50 for now. Or at least 45-45-10 or whatever percentage that allows the chance that he’s not with either the Lups or Pats. It would certainly be interesting if Noel works for Dogranio as well. But I will assume Noel’s got a third allegiance aside from the Lups or Pats. Heck I know Kogure is definitely hiding something from the Lups. And I still think Commander Hilltop is not on the up and up either. He’s been suspicious before. But his shutting down of the Pats and their doubts of Noel the last two episodes was a little bit too hard. So maybe that third faction has something to do with Kogure and Hilltop and even the real Lupin. Who knows? Maybe they’re Ganglers even. Dogranio telling Destra to let “X” run free for now is definitely interesting. Whatever the future holds, I definitely hope we’re in for some good twists. And that there is more to Noel and our other supporting characters than meets the eye. It would be very satisfying for both the Lups and Pats to get the rug pulled out from under them at the same time in the future. A big shocking reveal that floors both teams and maybe will be the impetus for them to work together. Oh! And that reminds me of Zamigo. Maybe he’s got something to do with all the shady stuff as well. At Episode 21, I think the show definitely needs to pick up the pace now. We seem to be far from the high of Episodes 14 and 15. But maybe we’re done with the breather and are gearing up for the midseason climax now. I hope!